Rotary screw air compressors operate by trapping air between two meshed rotors and reducing the volume of that trapped air as it moves down through the rotors. This reduction in volume results in compressed air, which can then be used to power air tools, inflate tires, or in numerous other applications. When most people think of air compressors, they picture reciprocating air compressors (also known as piston air compressors.) These air compressors physically push air into a small space, using pistons, and then collect that compressed air in an air receiver tank. Reciprocating air compressors are relatively inexpensive and have been around for decades. Rotary screw air compressors are a newer, improved type of air compressor. They are more expensive than traditional reciprocating models but have numerous benefits that are quickly making rotary screw air compressors the system of choice for service truck and van fleet managers around the world. Reciprocating Engine Driven Air Compressor or A Rotary Screw Engine Driven Air Compressor? Rotary screw air compressors used on trucks and vans are oil-injected, which means oil is used to lubricate and seal the rotors in the air-end. This allows the rotors to create high pressures quite quickly and compress air in a single stage. The oil then gets separated out from the air before the air exits the system and is recycled back into the air-end for reuse. Oil-injected rotary screws allow the compressor systems to provide high CFM and psi on a continuous basis. Oil-free rotary screw models are used in industrial, production or medical applications when absolutely no oil can enter the airflow, like for food packaging or medical oxygen. Oil-free rotary air compressors are more expensive, as they require 2 stages of compression to reach the same pressures of an oil-injected rotary system. Most companies only use oil-free rotary screw air compressors when they absolutely need to so oil-free air compressors aren’t usually found on vehicles. This guide is dedicated to rotary screw air compressors used on vehicles and therefore focuses on oil-injected rotary screws by default. Air enters the air-end through an inlet valve, where it is mixed with oil while being compressed. The oil is then separated from the air, which exits the system. Learn more about how the air compressor system works in the Basic Functions & Operations section below. While the air-end is where air compression actually happens, there are many additional components required to make a rotary screw air compressor work. That air filter can either be mounted directly to the compressor or remotely mounted and connected with an air intake hose. Cool, clean air should be considered when choosing the location of the filter. 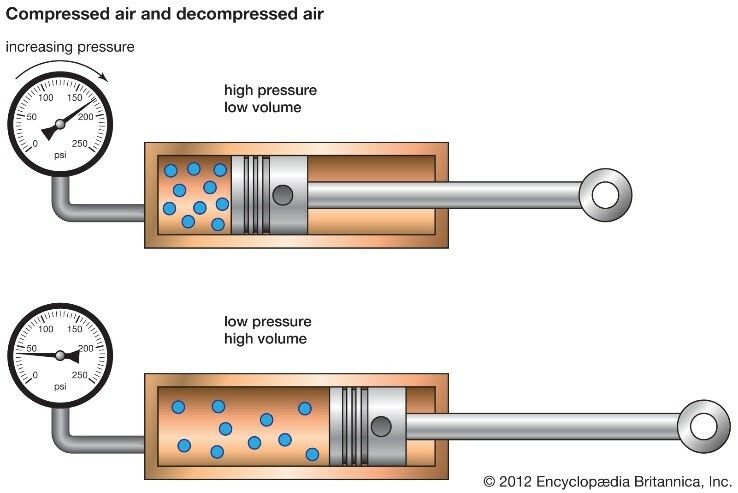 When compressed air leaves the air-end it is mixed with compressor oil. This mixture enters a primary separator tank where the first steps in separating the oil from the air happens. The primary separator tank uses mechanical separation and centrifugal force to drive oil molecules together, which form droplets that eventually fall to the bottom of the tank. 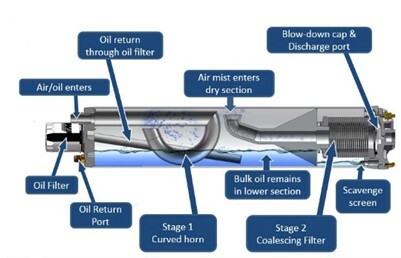 A large amount of oil is removed from the air in this stage. 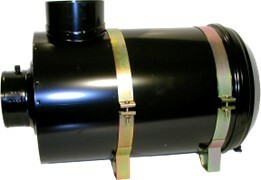 Often, the separator tank also acts as an oil reservoir. Once the compressed air leaves the primary separation tank it is close to being oil free. The remaining oil mist mixed with the air will enter the secondary separation filter, which is a coalescing filter. This filter includes a membrane material that gathers the remaining oil particles and circulates the oil back into the main oiling system. The air leaving the coalescing filter is considered oil free. 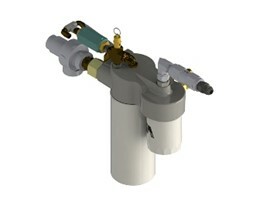 The secondary separation filter can be attached to the primary separation tank or mounted remotely on its own filter manifold. Figure 7 above includes both the primary separation filter (labeled Stage 1) and the secondary separation filter (Stage 2). As a rotary screw compressor has a closed loop oiling system, the installation must include an oil filter. The oil filter’s job is to collect any loose particles that have collected in the oil and shouldn’t re-enter the air compressor system. The oil filter can be located on the compressor, the separator tank or mounted remotely on a filter manifold. The process of compressing air generates heat and lots of it! 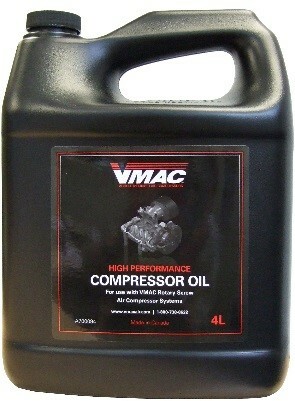 This heat warms up the oil, which must pass through a cooler before it is circulated back to the compressor. A liquid to liquid cooler can be used in conjunction with an engine’s cooling system or a stand-alone air to liquid cooler can be used; each has its own benefits. The liquid to liquid version will need sufficient cooling capacity to cool the compressor oil combined with the engine cooling. The air to liquid cooler will need clean, cool air to keep the oil within an optimal temperature range. 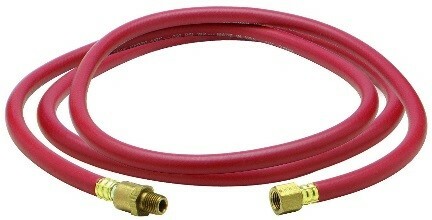 Moving oil and air between various air compressor components requires the use of hoses. The hoses must meet the requirements of heat, pressure and the chemical components of the compressor oil. Incorrect hose selection will result in premature failure of those hoses, which can be expensive and dangerous. Air compressors will use mechanical or electrical controls in the form of a button, switch, or lever. These controls will turn the air compressor off and on and may also provide important diagnostic or service information. The location and type of components used in the controls should reflect the environment the air compressor will be in. Oil is a critical component of an oil-injected rotary screw air compressor, performing many important jobs at once. Oil lubricates the system, protects components from wear, keeps the system cool, and helps trap and remove contaminants. Without the right type of synthetic oil, oil-injected rotary screw air compressors would not function. The components listed above are necessary, in some form, for a rotary screw air compressor system. There are many more options for filter manifolds, coolers, oil separators, and so forth. Each system is a bit different, which means the required components are as well. Some manufacturers use encapsulated air ends, which combine several components within the air end’s metal casing, including the rotors, intake valves, and separators in a seemingly convenient package. 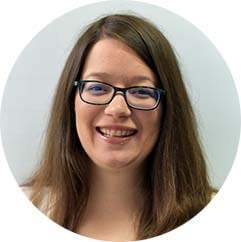 However, encapsulated air ends are bulky and restrictive, which can present design challenges for air compressor manufacturers, vehicle upfitters, and OEMs. The combined pieces result in an awkward, inflexible shape that must be accommodated. When manufacturers choose not to combine multiple components within an encapsulated air end, they have the freedom to design smaller systems with more efficient designs, without compromising on power or efficacy. 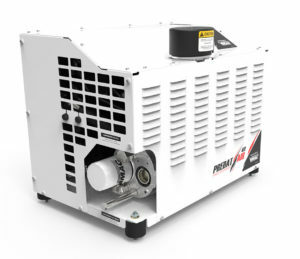 Rotary screw air compressors are pressurized systems, comprised of many interconnected components that work together to compress air. Air and oil are both important aspects of a rotary screw air compressor system. Compressed air is the end goal, which requires the use of atmospheric air, but the oil is just as important. Oil is used to lubricate the system and is the not-so-secret weapon that makes rotary screws so efficient at a lower price-point. But the use of oil also makes the air compressor systems more complex. In addition to requiring a mechanism for producing compressed air, rotary screw air compressors also need to circulate, filter, and recycle oil. Step 1: Atmospheric air enters the inlet valve. Step 2: Air flows through the system pressure line to a valve on the regulator, which sets the pressure for the entire system. Step 3: Air is mixed with oil and compressed via the rotors in the air-end. 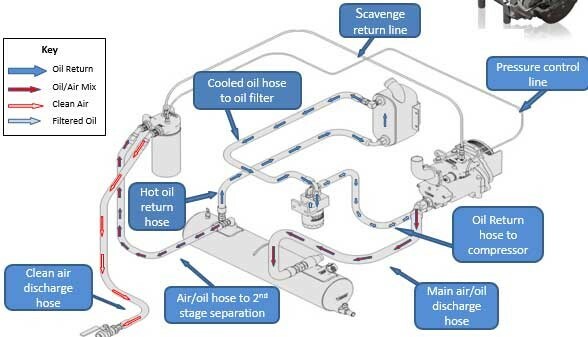 Step 4: Air mixed with oil exits the air-end via the air discharge hose. Step 5: Air mixed with oil enters the primary oil separator tank, which separates most of the oil from the air. Step 6: Air enters the second separation filters, which catches remaining oil mist in the air. Step 7 – A: Oil-free air exists the system; if an air receiver tank is used, the air collects in the tank. 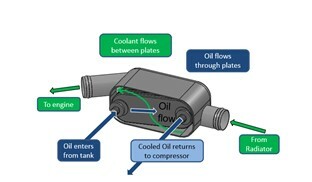 Step 7 – B: Oil is moved into the oil cooler, cooled down, and then sent to an oil filter. Step 8: The oil filter catches any debris remaining in the oil. Step 9: The recycled oil is returned to the air-end, via the scavenge line. Note that visualizing the process as steps makes it easier to understand the overall flow, but these steps operate concurrently. As soon as the air compressor is turned on, all the steps outlined above occur simultaneously and continuously. Air compressors need a power source to run. Fortunately, vehicle mounted air compressors have several options: a separate air compressor engine, using a truck’s existing engine, or tapping into an auxiliary power source like a PTO or hydraulic port. In summary, there are a lot of power options for mobile air compressors. The right one depends on a truck’s existing power options and whether they will work with an air compressor that provides enough CFM and psi. Vehicle engine mounted and hydraulic air compressors are convenient, while standalone engines are efficient and cost-effective. Air power is typically measured in CFM and psi. CFM or “Cubic Feet per Minute”, is the amount of air that’s being delivered. Meanwhile, psi or “Pounds per Square Inch” is the amount of force behind that air. Together, CFM and psi determine how much air is being delivered and at what pressure. Air tools require the right psi and the right CFM to operate efficiently. Rotary screw air compressors tend to produce lower psi than reciprocating air compressors, but this isn’t a problem for most mobile air applications. Most air tools run at 80 to 110 psi, which is well within the capabilities of rotary screw air compressors. How Many CFM Do I Need To Run Air Tools? Rotary screw air compressors have many benefits that make them ideal for both mobile and standalone applications. As a result, you’ll find rotary screw air compressors on vehicles and trailers, as well as in industrial, production and medical facilities, where high quality equipment is required. Most people appreciate the longevity, reliability, and easy access to instant air. Because rotary screw air compressors can run continuously, there’s no need to wait for an air receiver tank to fill before you can start using the air. Those tend to be the most popular benefits of rotary screw air compressors. Many operators also appreciate the limited lifetime warranties that come with some rotary screw air compressors, like VMAC’s. These types of warranties are available because the rotors and air-ends are proven to stand the test of time—or, more specifically, the life of a modern service truck. This longevity makes rotary screw compressors a drama-free option. For example, the very first VMAC rotary screw air-end outlived the truck it was installed on. 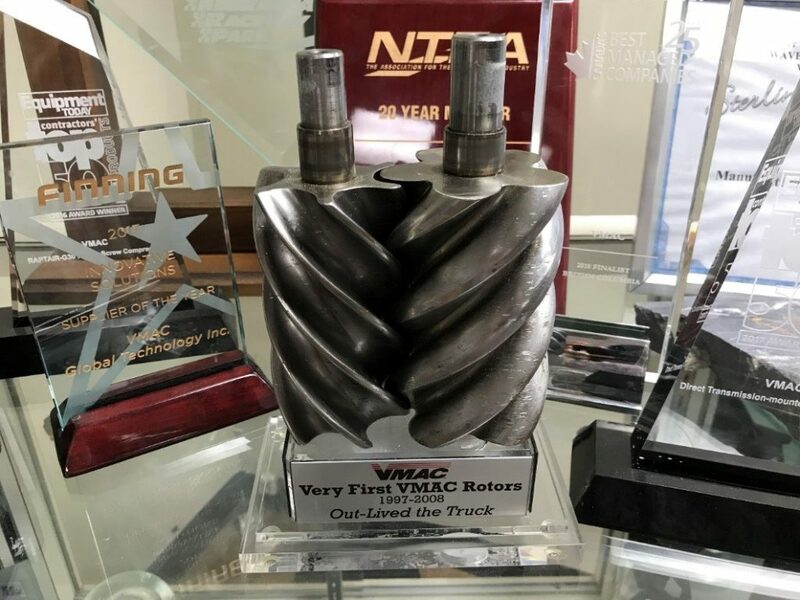 The rotors were returned to us and now have a permanent home in our trophy case. Rotary screw air compressors’ lengthy lifespan is a huge advantage over reciprocating air compressors, which are jokingly referred to as “throw-away air compressors” because they’re expected to fail after 3 to 5 years. The number one reason people choose a reciprocating air compressor over a rotary screw is the initial cost. Rotary screw air compressors often cost twice as much as reciprocating air compressors, but it’s a situation where you genuinely get what you pay for. Rotary screw air compressors may be 2x the cost, but they last at least 4x longer, on average, and produce more air. That makes them a solid investment for any business that plans to use compressed air over the long term. The other disadvantage to rotary screw air compressors is that they require skilled maintenance. Every type of air compressor needs regular servicing, but the complex nature of rotary screw systems requires a higher level of expertise. 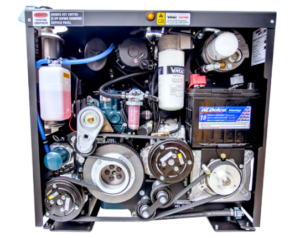 UNDERHOOD™ air compressor systems are one of the coolest options out there, as the air compressor components are integrated with existing truck or van components. 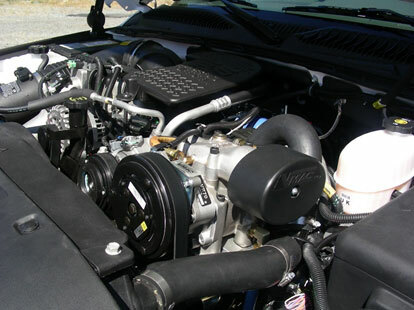 The air-end is mounted in the engine compartment and the compressor system is powered by the vehicle’s existing engine. UNDERHOOD™ air compressors are super light, weighing in at 62 to 200 lbs (depending on the system), which saves precious GVW and cargo space. 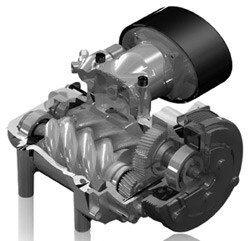 The Direct-Transmission Mounted air compressor uses a vehicle’s PTO to drive the air compressor. Like the UNDERHOOD™, the DTM is a lightweight “out of sight” option that integrates with a vehicle’s existing components. The G30 gas driven air compressor has a separate Honda GX390 gas engine, like you’d find in a ride-on lawn mower or other small vehicles. This style of air compressor is mounted to a truck or van and can be easily accessed by any operator with a key. 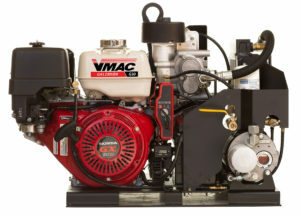 Similar to the G30, VMAC’s D60 is a diesel driven air compressor with its own Kubota diesel engine. These air compressors are also easily mounted to a work vehicle. Vehicles that have existing hydraulic systems can tap into those systems to power their air compressor. The VMAC hydraulic driven air compressor makes sense for operators with hydraulic cranes and other hydraulic-powered equipment. Multipower or multifunction systems are a popular option now being offered by some manufacturers. Multipower systems combine air compressors with other vehicle-mounted equipment, such as welders, generators, and boosters, in one convenient system. 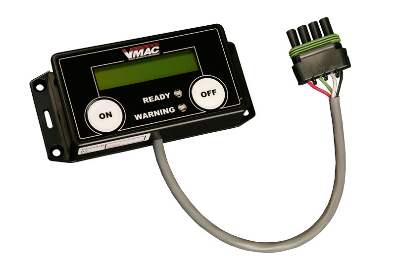 VMAC’s Multifunction Power systems are powered by a Kubota diesel engine. Rotary screw air compressors are made up of numerous parts that need to be assembled into a highly efficient system. 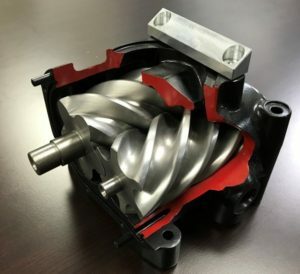 True air compressor manufacturers will create these parts within their facilities, using an in-house foundry, CNC machines, and other specialized equipment to make the required components. Individual components are then assembled on-site into an air compressor system. When engineering and manufacturing parts for any system or machine, there is an acceptable margin of error, called tolerance. The required dimensions for air ends in rotary air compressor systems are so precise that these tolerances are incredibly low. Computer Numerical Control machines—CNC machines, for short—allow manufacturers to meet the exact tolerances needed for rotary screw air compressors. 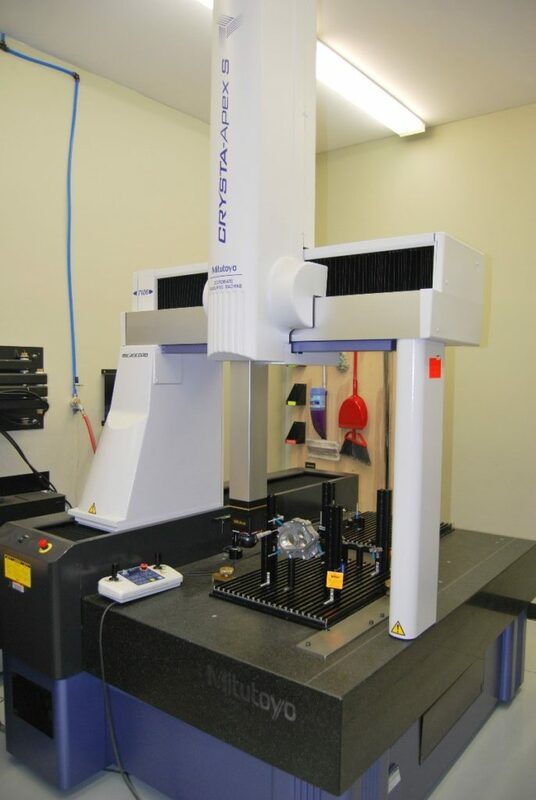 A stringent quality control process ensures the required tolerances for each machine are met. 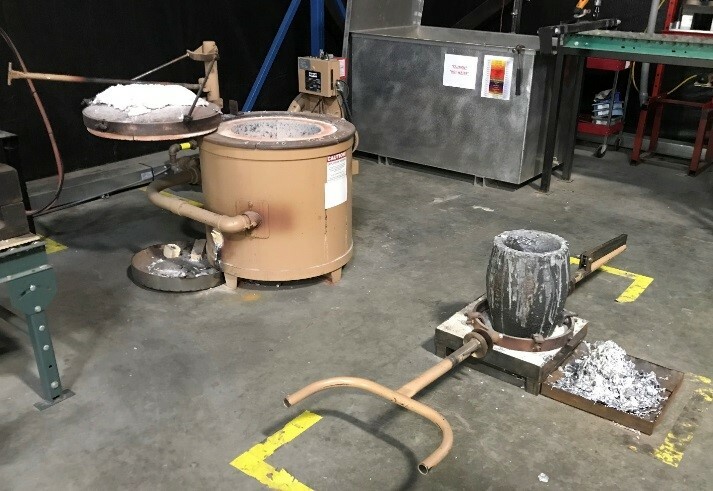 If a machine fails to produce parts within the acceptable tolerance, those parts are melted back down or otherwise recycled. The designs and machines will also be evaluated and adjusted, as needed. 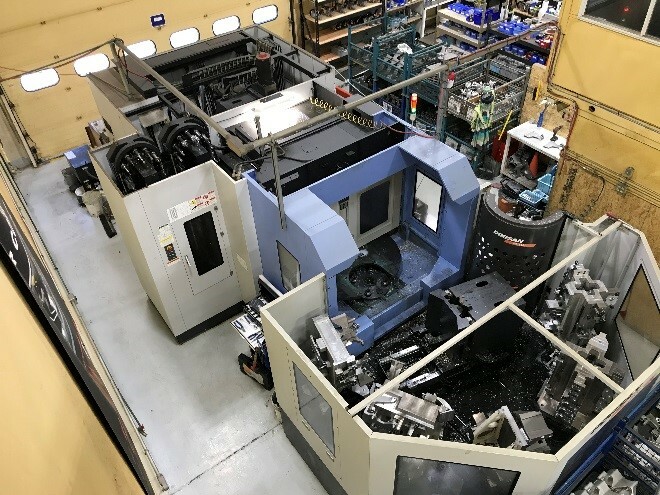 Fortunately, manufacturers using modern quality control technology can usually predict when a CNC machine will need to be adjusted well in advance, and plan for it accordingly. The major advantage to making parts on-site is that the parts can be modified at will. Instead of being restricted by existing component shapes and sizes, true manufacturers have the freedom to innovate on individual parts on their own desired schedule, creating more efficient, powerful and compact air compressor systems. 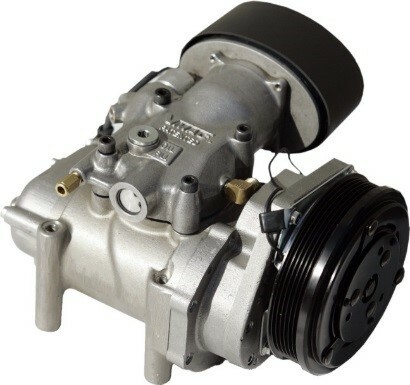 A more common type of air compressor manufacturer will purchase existing parts from suppliers or, less often, contract their creation out to external companies. If a custom part is required, these air compressor companies have to book a space with third-party foundries, machinists, and so forth, and then rely on their general expertise for modifications. 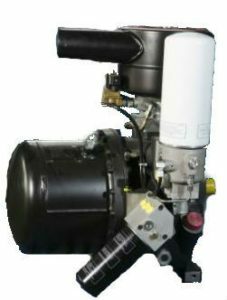 This style of air compressor manufacturer essentially assembles pre-purchased pieces into air compressors before shipping them out to customers. 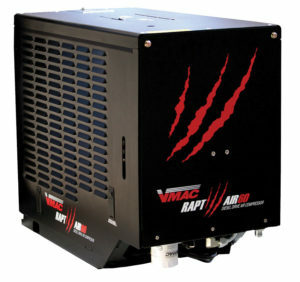 VMAC is one of the only true rotary screw air compressor manufacturers in North America.